2. Use the oidgen.vbs script provided by Microsoft. This method generates a random GUID and hangs it off an existing OID owned by Microsoft. Another option not referred to by Microsoft is to contact the Internet Assigned Numbers Authority (IANA) and request a Private Enterprise Number (PEN). The process is free an you will be able to acquire your very own root OID within 30 days of submitting a request. Obviously, the scripted method is the quickest and simplest. I guess the only downside is that there is a (very) remote possibility that the same OID can be generated twice. Hidden away on the Q&A page of the oidgen.vbs script is a really nice little Powershell script that does the equivalent. The script is written by Jiri Formacek of Microsoft and I take absolutely no credit for it. Microsoft’s root OID is shown in bold. As you can see the remaining portion is fairly long. I’m no mathematician, but what are the chances of the same OID being generated twice? I guess it depends a little on the algorithm used to generated the new GUID. Even if that scenario were to occur, what are the chances of the same schema extensions using the identical OID being used in more than one organisation? Your approach will depend on your attitude to risk, but if you are not a software vendor then I would think it fairly safe to use the scripted approach for your custom extensions. Posted by admin on March 18, 2013 at 7:55 pm under Active Directory, AD LDS / ADAM, PowerShell. Quest Software make it hard to love them sometimes. 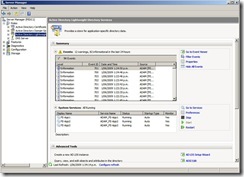 When they made Quest Quick Connect Express for Active Directory available at no cost it was a real boon for anyone wanting to synchronise objects from AD to AD (or AD LDS instances). In particular it offered a great free method of achieving GAL Sync between two Exchange Organisations, the likes of which have not been seen since the days of Microsoft’s Identity Integration Feature Pack (IIFP – a cut down version of MIIS/ILM/FIM). I thought was smart, strategic thinking on Quest’s part: make the sync engine available with basic functionality to get everyone used to the product and then generate revenue through add-on licences for other data sources (generic LDAP, SQL, Oracle, etc.). Sadly, the strategic approach seems to have been thrown out in the (mistaken) belief that charging for the AD connector will bring in more revenue. Hopefully Dell (Quest’s new owner) will hear the howls of derision and bring back the free version. Now that I’ve got that off my chest, what are the options left for (free) GAL Sync? Well, if you have a copy of the Quest One Quick Connect Sync Engine version 4.7 or 5.0 you can still use these to achieve GAL Sync free of charge. 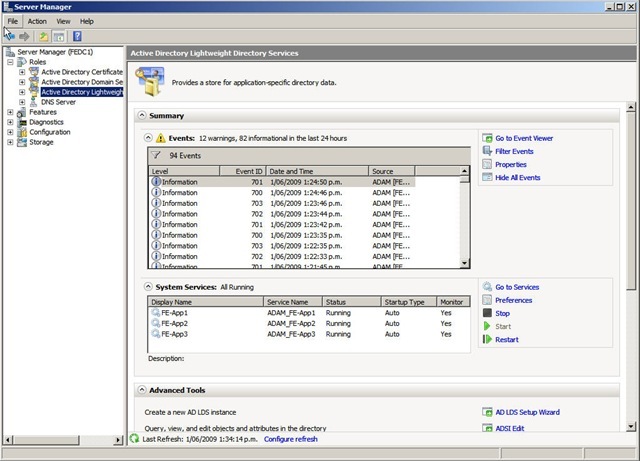 The current version of the Sync Engine (5.1) has had the AD DS/AD LDS connectors disabled so if you download that you will need to purchase a Quest One Quick Connect Express for Active Directory licence to get the old functionality back. If you have version 5.0 downloaded somewhere, consider yourself lucky – and hold on to it! Posted by admin on September 12, 2012 at 10:56 pm under AD LDS / ADAM, Exchange Server, GAL Sync. In my last post, I provided a small batch file to support scheduled IFM dumps of an AD LDS instance. Afterwards, I realised that batch files are sooo last century and decided to have a crack at the Powershell version. I’m no Bwandon, but the script below seems to do the trick. # backup. To be run nightly as a scheduled task. Posted by T on April 21, 2009 at 2:44 am under Active Directory, AD LDS / ADAM, Scripting, Windows Server 2008. Microsoft Technet describes how to back up an AD LDS instance using either Windows Server Backup or Dsdbutil.exe. Interestingly, the Dsdbutil method leverages the Install From Media (IFM) feature to perform the backup. Here’s a small batch file that you can use to schedule the backup using the Task Scheduler. Posted by T on April 9, 2009 at 2:02 am under Active Directory, AD LDS / ADAM, Windows Server 2008. Exposing AD LDS Snapshot with Dsamain? Don’t forget the switch! I really like the snapshot feature of Windows Server 2008 AD and have been using it quite a bit recently. This week I had my first foray into snapshotting with AD LDS. Everything is pretty much the same as for AD, the only obvious difference being that you can create the snapshots using either dsdbutil or ntdsutil with AD LDS. I was somewhat surprised then to see a nasty looking error (see below) when I fired up Dsamain.exe to expose my freshly taken AD LDS snapshot. Restore the local directory service from backup media. It turns out the -adlds parameter is optional only in the sense that you don’t (and in fact must not) include it when using Dsamain.exe with AD. It is mandatory when using AD LDS. Once I included the -adlds parameter everything fired up normally. Another case of RTFM for me. Posted by T on April 2, 2009 at 10:34 pm under Active Directory, AD LDS / ADAM, Windows Server 2008.